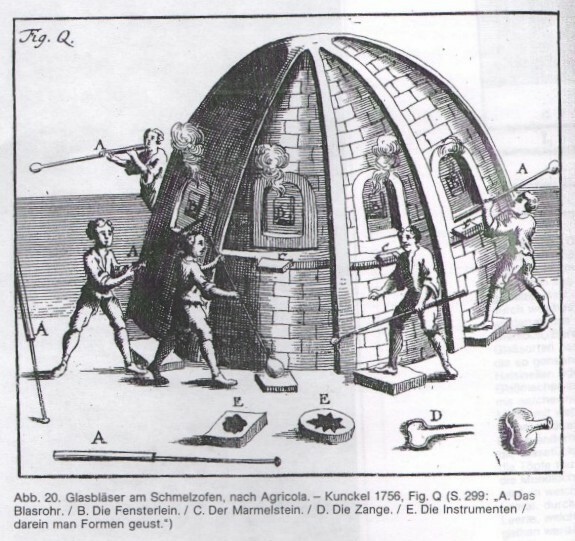 One of the most fascinating aspects of glassblowing is that the fundamentals and basic tools have not changed for many centuries, even millenia. 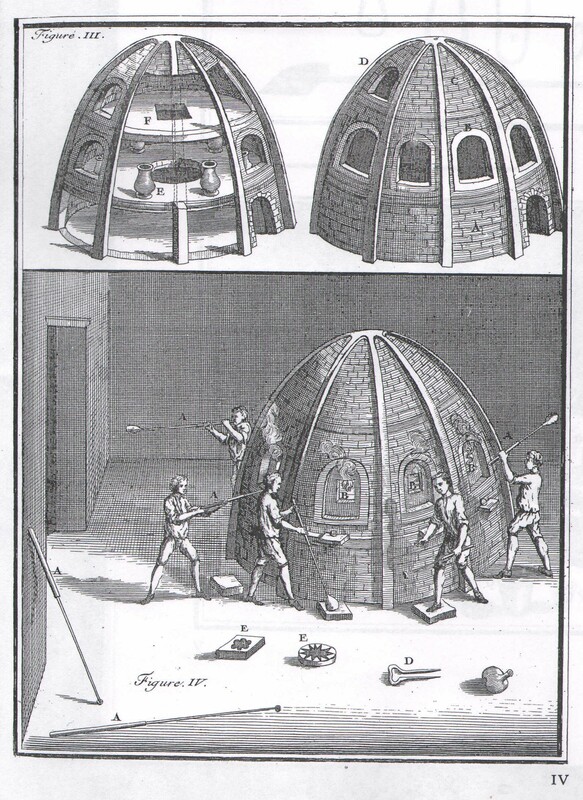 I am indebted to the research librarians at the Rakow Research Library at Corning Museum of Glass for helping me research the very early history of optic molds. 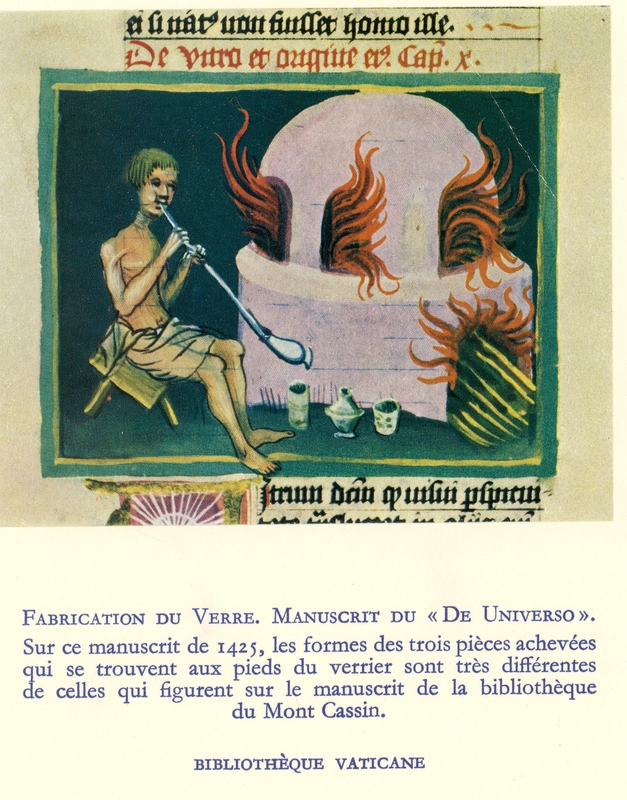 Although the image above was scanned from a French book (hence the French subtitle), the original, in the Vatican Library, is De Universo by Hrabanus Maurus (Rabanus Maurus), written in Latin, as well as translated into German, and dated 1425. Consider that this predates the invention of the printing press by Johannes Gutenberg around 1440! It is clear to me that there is an optic mold closest to the left foot of the glassblowing in this image, you can see a bit of vertical lines at the top of that optic mold. If you look at the full-size (6.0 MegaByte) image (by clicking above), I would suggest that you are looking at a 10-Point or 12-Point optic mold, since at least 5 vertical mold lines are clearly visible. 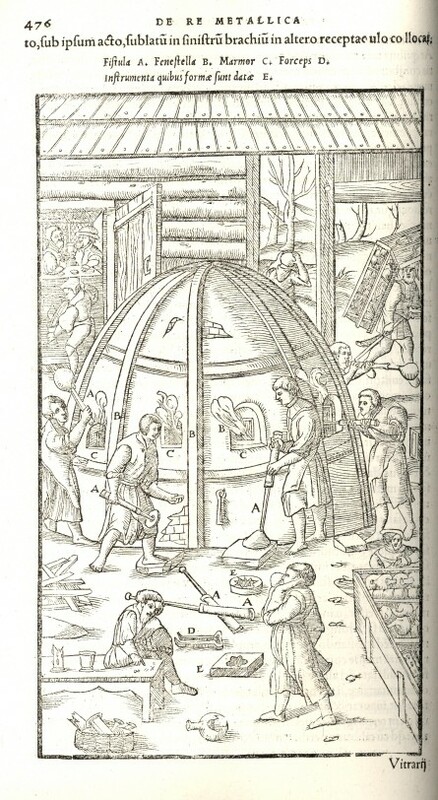 de celles qui figurent sur le manuscrit de la bibliotheque du Mont Cassin. 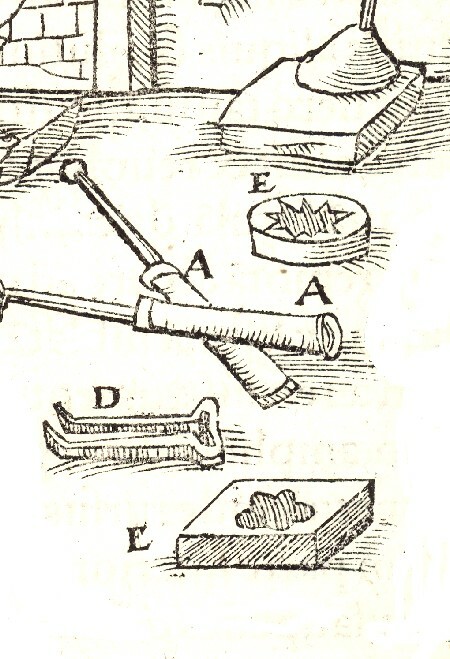 are very different those which are reproduced on the manuscript of the library of the Cassin Mount. What is interesting is that the book "Renaissance and Renascences in Western art" By Erwin Panofsky, American Council of Learned Societies, Published by Harper & Row 1969, states that the 1425 book is a German copy after a Carolingian Manuscript, which would seem that the origins of this could be much older. That image can be found here. 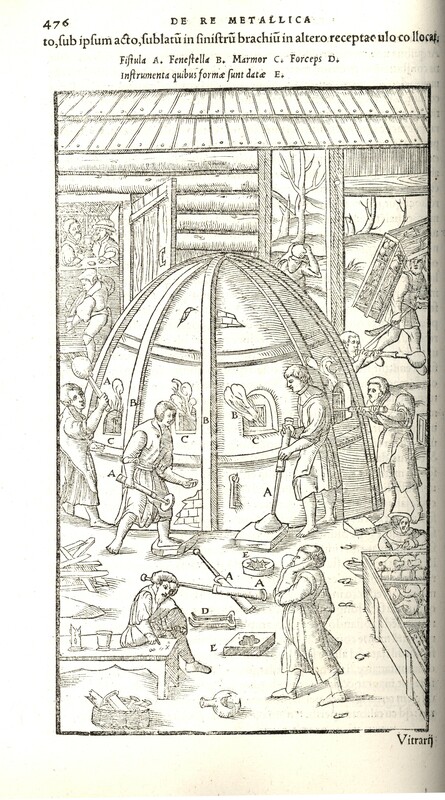 It clearly shows two glassblowing molds (labelled "E") on the floor near the furnace. English (1912) by Herbert C. Hoover and Lou H. Hoover. 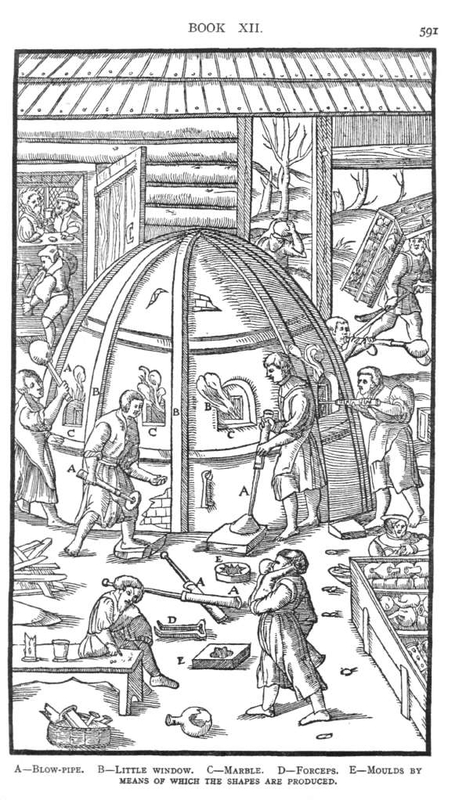 "Moulds by means of which the shapes are produced"
Click here if you would like to see Agricola's image above as printed in Hoover's 1912 English translation, with English subtitles. In fact, Neri has the SAME TWO OPTIC MOLDS still shown as "E"
to give even 30-degree increments around the circumference. "Die Instrumenten darein man formen geust." 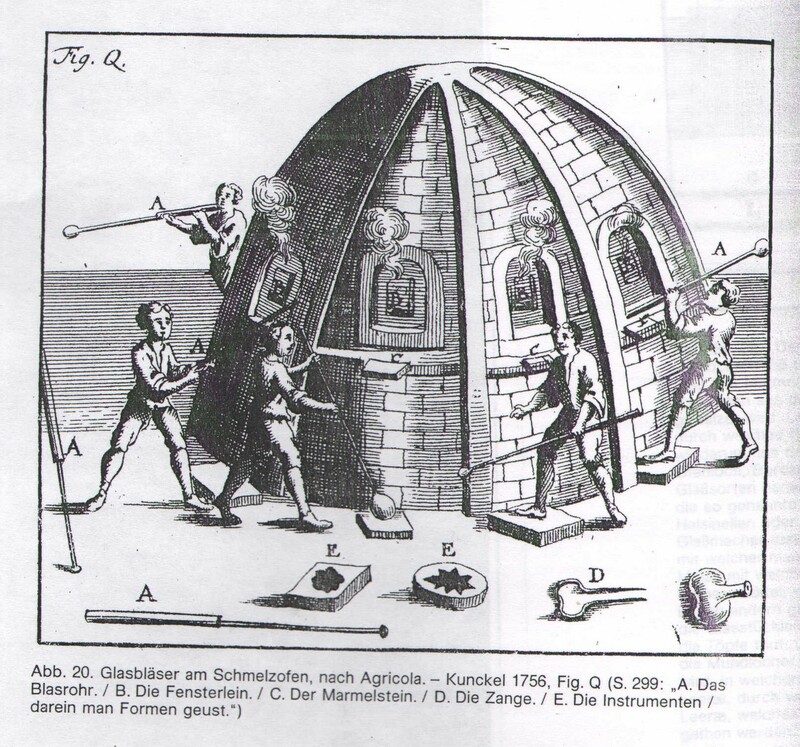 "the instruments thereon one shapes"
although the lobed mold appears less well defined. If you look around any glassblowing studio ("hot shop"), especially around the marver, which typically has at least one shelf inside it, you will almost certainly find OPTIC MOLDS of many different shapes and sizes. Steinert Industries appears to me to be the premier manufacturer of glassblowing Optic molds, with a mind-bogling variety of shapes and sizes. Please note that I have no financial interest or motivation in recommending Steinert Industries but it is my personal belief that they are an extremely quality company providing excellent glassblowing tools at reasonable cost. There are many other optic molds sold which are smaller than 4" tall, these are often used in lampworking / bead-making, and are not included on this web page. so I correct that oversight with this web page.